I decided to bust out some of my brass etch symbols for these fellas just to add even more levels of blingosity. Battle damage on his shoulder pad! Pretty pleased with how it came out. Also made good use of my parchment decals on his right shoulder. Another muzzle flash, because why not. Also his bolter barrel was a bit lopsided (yaaay finecast) so this was a good way of covering it up. Squad leader dude! I really love these Spartan style helmets. Aaaaand that's it. 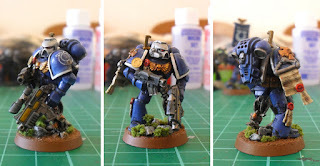 NEXT UP: probably more Ultramarines of some kind. Woah.